zinnias, originally uploaded by jahansell. What's a summer garden without zinnias? All around Sharon, gardens seem to be more beautiful than ever - a combination of not-too-hot temperatures, sunny days plenty of rain has made for perfect conditions. I'm going floral as well tomorrow Jenny, trouble is, I haven't got a clue what my flower is named!! 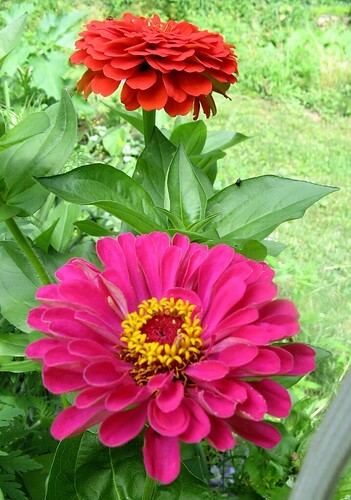 I love the colours of these Zinnias...such beautiful daisy like flowers. My Zinnias aren't any where near as nice. Beautiful.